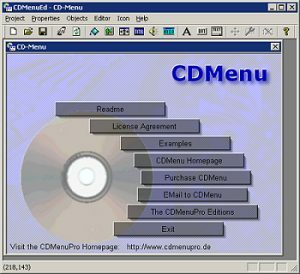 CDMenu LE is an inexpensive light-weight version of CDMenuPro. This edition has been developed to provide home users on a smaller budget the opportunity to purchase a less expensive autorun software product for their DVD and CD menu projects. For this reason the CDMenu LE is restricted to home use. With CDMenu and help from a WYSIWYG editor you can design your own menu interface in no time at all. Launching files or programs is made child's play. ...... ..) or programs is made child's play. CDMenu generates all files required for autostart (Autorun.inf). The buttons can be used to link any registered document or any program. CDMenu itself has the "know-how" required to launch files along with their applications. This means, for instance, that HTML files can be simply linked with a button. CDMenu locates the browser installed on the system, starts the browser and displays the HTML file. Add a designer-created splash screen and even background music. With the Trailer feature, CDMenu offers users instant information about the CD. A Bitmap Icon Converter assists with the creation of individual icons. These icons can be used as hard-drive and/or program icons. A tutorial on the creation of icons is available here. Qweas is providing links to CDMenu 2.40.02 as a courtesy, and makes no representations regarding CDMenu or any other applications or any information related thereto. Any questions, complaints or claims regarding this application CDMenu 2.40.02 must be directed to the appropriate software vendor. You may click the publisher link of CDMenu on the top of this page to get more details about the vendor.